Review of Eve by Anna Carey | What YA Reading? Picture this: you’re at the bookstore, looking for a good read. You see an amazing cover and reach for it, turning it over to read the description on the back. 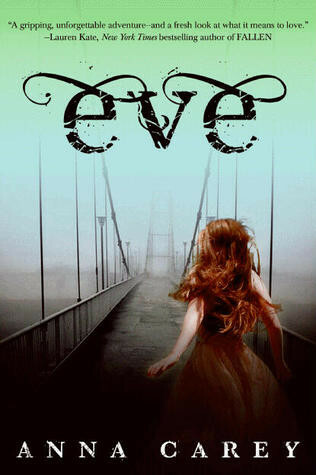 Eve is a dystopian–Your favourite genre!–about a plague that orphans children, whom are sent to schools. Eve is a teenager attending one of these, but on the eve (no pun intended) of her high school graduation, she discovers thereal purpose of the schools, and makes a decision that changes her life forever. You can’t wait to read this! You rush to the cash and fish out your wallet, shoving paper bills at the cashier. In the mad rush to get home and start the best book of your life, you realize that you forgot to read the last paragraph of the description. Quickly, you read it… and grimace. Women fearing men? How… utterly and totally oppressive. This is not what you had in mind. But you start reading Eve nonetheless… it can’t be that bad, right? Unfortunately, ladies and gentleman, it can. First of all, I hate the idea of Eve. To have a complete book based on woman’s fear of man is dismal, depressing, and, quite frankly, atrocious. And the author is a woman? Jeez, lady, get your head screwed on right and your marriage in order! The whole inferiority complex is definitely not attractive. I hear that good lotion works much better. Secondly, I dislike Eve. A lot. Honestly, I can’t remember the last time I’ve read about such a whiny heroine. And for someone so smart (and beautiful, and hard-working, and perfect…), Eve makes a lot of mistakes that cause a lot of deaths. She meant well… but so did Adolf Hitler during WWII. Also, during the third or fourth chapter of this book, Eve is informed that someone wants to capture her for three reasons: she’s pretty, smart, and compliant. There is a lot of publicity about this, and soon enough, the soldiers begin hunting her. I don’t understand why this person would be after her, tearing so many soldiers from their usual posts, causing so much news about somebody escaping from a supposedly safe and well-guarded school, and basically causing terrible, terrible chaos in a new America whose citizens might not be able to take it. Aren’t there other pretty, smart, and compliant girls in the world? Actually, like many other reviewers, I didn’t understand a lot of concepts inEve; the world building is horribly lacking. For one thing, Eve and her schoolmates are given a wonderful education at an amazing school. As mentioned in the description, Eve discovers that her teachers have been lying to her, she actually isn’t going to have a job in the city, or a job at all, and her education and hard work were all for nothing. Why, I ask myself? Why did the King (Yes, this New America is ruled by a king) waste such effort on high-end books in high-end schools, if the education was all for nothing? The reason for giving the ladies an education at all is explained… but why waste good time and effort on a ridiculously superior education in a new world, if they won’t be needing it ever again? Also, I commented before on the fact that a plague wiped out most of the Earth’s population. All we ever find out about this plague is that its victims cough a lot before dying. And, oh yeah, they turn purple. Right. My mind is filled with questions: What caused this plague? Where did it first develop? How does one contract it? Why wasn’t a cure realized before most of the humans died? Why did it only last 1 or 2 years… what contained it? Everyone knows that one cure is not enough to contain a full-blown plague. If you can’t understand a world’s history, you can’t really understand the world. That’s how I felt with Eve. Some other things in this book bothered me; namely, the ending. Eve works so hard to make something–I won’t say what– work throughout the novel. But on the last page of the last chapter, she gives it all up. After working so hard to achieve this, after sacrificing so much (And by ‘so much’, I mean others’ lives), one would think that Eve would evolve as a character and reach her goal. But no. She just sheds a tear or two, shrugs, and says: “It’s all good… I might be able to fix this later.” What in the devil? Didn’t you learn anything throughout your long and perilous journey, Eve? Anything? Any value at all? Apparently not. But I’m going to stop bashing on Eve now. Eve does improve herself throughout the book. She gets over her fear of men and realizes–completely– that everything she learned while at school was based on what to tell girls to make them more docile. She even gets over some of her naivety. Caleb was the perfect, Gone-with-the-Wind-style gentleman. He never stops believing in Eve, always rushes to her rescue (But don’t worry, girls, Eve does save herself… at some point. ), and although sometimes I asked myself ”Is this guy for real?”, I really enjoyed him as a character. Carey does have good writing skills. She’s great with grammar, uses beautiful imagery, and her pages containing no dialogue didn’t bore me at all. That’s pretty great, for a debut author. She just has some plot holes and major world building issues. Finally, Eve is a 2.5/5 star dystopian. For subservient ladies and imagery lovers!